Proprietary Name: Ezetimibe What is the Proprietary Name? Non-Proprietary Name: Ezetimibe What is the Non-Proprietary Name? Ezetimibe with NDC 70518-1927 is a a human prescription drug product labeled by Remedyrepack Inc.. The generic name of Ezetimibe is ezetimibe. The product's dosage form is tablet and is administered via oral form. FDA Application Number: ANDA209234 What is the FDA Application Number? Monotherapy Ezetimibe Tablets, administered alone, is indicated as adjunctive therapy to diet for the reduction of elevated total cholesterol (total-C), low-density lipoprotein cholesterol (LDL-C), apolipoprotein B (Apo B), and non-high-density lipoprotein cholesterol (non-HDL-C) in patients with primary (heterozygous familial and non-familial) hyperlipidemia. Combination Therapy with HMG-CoA Reductase Inhibitors (Statins) Ezetimibe Tablets, administered in combination with a 3-hydroxy-3-methylglutaryl-coenzyme A (HMG-CoA) reductase inhibitor (statin), is indicated as adjunctive therapy to diet for the reduction of elevated total-C, LDL-C, Apo B, and non-HDL-C in patients with primary (heterozygous familial and non-familial) hyperlipidemia. Combination Therapy with Fenofibrate Ezetimibe Tablets, administered in combination with fenofibrate, is indicated as adjunctive therapy to diet for the reduction of elevated total-C, LDL-C, Apo B, and non-HDL-C in adult patients with mixed hyperlipidemia. The combination of Ezetimibe Tablets and atorvastatin or simvastatin is indicated for the reduction of elevated total-C and LDL-C levels in patients with HoFH, as an adjunct to other lipid-lowering treatments (e.g., LDL apheresis) or if such treatments are unavailable. Ezetimibe Tablet is indicated as adjunctive therapy to diet for the reduction of elevated sitosterol and campesterol levels in patients with homozygous familial sitosterolemia. The effect of Ezetimibe Tablets on cardiovascular morbidity and mortality has not been determined. Ezetimibe Tablets has not been studied in Fredrickson Type I, III, IV, and V dyslipidemias. The recommended dose of Ezetimibe Tablets is 10 mg once daily. Ezetimibe Tablets can be administered with or without food. Ezetimibe Tablets may be administered with a statin (in patients with primary hyperlipidemia) or with fenofibrate (in patients with mixed hyperlipidemia) for incremental effect. For convenience, the daily dose of Ezetimibe Tablets may be taken at the same time as the statin or fenofibrate, according to the dosing recommendations for the respective medications. 10-mg tablets are white to off white capsule shaped, flat faced, beveled edge tablets, debossed with “A25ˮ on one side and plain on other side. Ezetimibe Tablet is contraindicated in the following conditions: The combination of Ezetimibe Tablets with a statin is contraindicated in patients with active liver disease or unexplained persistent elevations in hepatic transaminase levels. Women who are pregnant or may become pregnant. Because statins decrease cholesterol synthesis and possibly the synthesis of other biologically active substances derived from cholesterol, Ezetimibe Tablets in combination with a statin may cause fetal harm when administered to pregnant women. Additionally, there is no apparent benefit to therapy during pregnancy, and safety in pregnant women has not been established. If the patient becomes pregnant while taking this drug, the patient should be apprised of the potential hazard to the fetus and the lack of known clinical benefit with continued use during pregnancy. Concurrent administration of Ezetimibe Tablets with a specific statin or fenofibrate should be in accordance with the product labeling for that medication. In controlled clinical monotherapy studies, the incidence of consecutive elevations (≥3 x the upper limit of normal [ULN]) in hepatic transaminase levels was similar between Ezetimibe Tablets (0.5%) and placebo (0.3%). In controlled clinical combination studies of Ezetimibe Tablets initiated concurrently with a statin, the incidence of consecutive elevations (≥3 x ULN) in hepatic transaminase levels was 1.3% for patients treated with Ezetimibe Tablets administered with statins and 0.4% for patients treated with statins alone. These elevations in transaminases were generally asymptomatic, not associated with cholestasis, and returned to baseline after discontinuation of therapy or with continued treatment. When Ezetimibe Tablet is co-administered with a statin, liver tests should be performed at initiation of therapy and according to the recommendations of the statin. Should an increase in ALT or AST ≥3 x ULN persist, consider withdrawal of Ezetimibe Tablets and/or the statin. In clinical trials, there was no excess of myopathy or rhabdomyolysis associated with Ezetimibe Tablets compared with the relevant control arm (placebo or statin alone). However, myopathy and rhabdomyolysis are known adverse reactions to statins and other lipid-lowering drugs. In clinical trials, the incidence of creatine phosphokinase (CPK) >10 x ULN was 0.2% for Ezetimibe Tablets vs. 0.1% for placebo, and 0.1% for Ezetimibe Tablets co-administered with a statin vs. 0.4% for statins alone. Risk for skeletal muscle toxicity increases with higher doses of statin, advanced age (>65), hypothyroidism, renal impairment, and depending on the statin used, concomitant use of other drugs. In post-marketing experience with Ezetimibe Tablets, cases of myopathy and rhabdomyolysis have been reported. Most patients who developed rhabdomyolysis were taking a statin prior to initiating Ezetimibe Tablets. However, rhabdomyolysis has been reported with Ezetimibe Tablets monotherapy and with the addition of Ezetimibe Tablets to agents known to be associated with increased risk of rhabdomyolysis, such as fibrates. Ezetimibe Tablets and any statin or fibrate that the patient is taking concomitantly should be immediately discontinued if myopathy is diagnosed or suspected. The presence of muscle symptoms and a CPK level >10 x the ULN indicates myopathy. Due to the unknown effects of the increased exposure to ezetimibe in patients with moderate to severe hepatic impairment, Ezetimibe Tablet is not recommended in these patients. Alanine aminotransferase increased (0.6%) Myalgia (0.5%) Fatigue, aspartate aminotransferase increased, headache, and pain in extremity (each at 0.2%) The most commonly reported adverse reactions (incidence ≥2% and greater than statin alone) in the Ezetimibe Tablets + statin controlled clinical trial database of 11,308 patients were: nasopharyngitis (3.7%), myalgia (3.2%), upper respiratory tract infection (2.9%), arthralgia (2.6%) and diarrhea (2.5%). The frequency of less common adverse reactions was comparable between Ezetimibe Tablets and placebo. Combination with a Statin In 28 double-blind, controlled (placebo or active-controlled) clinical trials, 11,308 patients with primary hyperlipidemia (age range 10 to 93 years, 48% women, 85% Caucasians, 7% Blacks, 4% Hispanics, 3% Asians) and elevated LDL-C were treated with Ezetimibe Tablets 10 mg/day concurrently with or added to on-going statin therapy for a median treatment duration of 8 weeks (range 0 to 112 weeks). The incidence of consecutive increased transaminases (≥3 x ULN) was higher in patients receiving Ezetimibe Tablets administered with statins (1.3%) than in patients treated with statins alone (0.4%). The numbers of patients exposed to co-administration therapy as well as fenofibrate and ezetimibe monotherapy were inadequate to assess gallbladder disease risk. There were no CPK elevations >10 x ULN in any of the treatment groups. ; elevations in liver transaminases; hepatitis; abdominal pain; thrombocytopenia; pancreatitis; nausea; dizziness; paresthesia; depression; headache; cholelithiasis; cholecystitis. Caution should be exercised when using Ezetimibe Tablets and cyclosporine concomitantly due to increased exposure to both ezetimibe and cyclosporine. Cyclosporine concentrations should be monitored in patients receiving Ezetimibe Tablets and cyclosporine.The degree of increase in ezetimibe exposure may be greater in patients with severe renal insufficiency. In patients treated with cyclosporine, the potential effects of the increased exposure to ezetimibe from concomitant use should be carefully weighed against the benefits of alterations in lipid levels provided by ezetimibe.
. Co-administration of Ezetimibe Tablets with fibrates other than fenofibrate is not recommended until use in patients is adequately studied. 0-24hr for total ezetimibe). Ezetimibe crossed the placenta when pregnant rats and rabbits were given multiple oral doses. Multiple-dose studies of ezetimibe given in combination with statins in rats and rabbits during organogenesis result in higher ezetimibe and statin exposures. Reproductive findings occur at lower doses in combination therapy compared to monotherapy. All statins are contraindicated in pregnant and nursing women. When Ezetimibe Tablet is administered with a statin in a woman of childbearing potential, refer to the pregnancy category and product labeling for the statin. It is not known whether ezetimibe is excreted into human breast milk. In rat studies, exposure to total ezetimibe in nursing pups was up to half of that observed in maternal plasma. Because many drugs are excreted in human milk, caution should be exercised when Ezetimibe Tablet is administered to a nursing woman. Ezetimibe Tablets should not be used in nursing mothers unless the potential benefit justifies the potential risk to the infant. * For triglycerides, median % change from baselineFrom the start of the trial to the end of Week 33, discontinuations due to an adverse reaction occurred in 7 (6%) patients in the Ezetimibe Tablets co-administered with simvastatin group and in 2 (2%) patients in the simvastatin monotherapy group.During the trial, hepatic transaminase elevations (two consecutive measurements for ALT and/or AST ≥3 x ULN) occurred in four (3%) individuals in the Ezetimibe Tablets co-administered with simvastatin group and in two (2%) individuals in the simvastatin monotherapy group. Elevations of CPK (≥10 x ULN) occurred in two (2%) individuals in the Ezetimibe Tablets co-administered with simvastatin group and in zero individuals in the simvastatin monotherapy group. In this limited controlled study, there was no significant effect on growth or sexual maturation in the adolescent boys or girls, or on menstrual cycle length in girls. Co-administration of Ezetimibe Tablets with simvastatin at doses greater than 40 mg/day has not been studied in adolescents. Also, Ezetimibe Tablets has not been studied in patients younger than 10 years of age or in pre-menarchal girls. Based on total ezetimibe (ezetimibe + ezetimibe-glucuronide), there are no pharmacokinetic differences between adolescents and adults. Pharmacokinetic data in the pediatric population <10 years of age are not available. close monitoring when administered concomitantly with Ezetimibe Tablets in patients with moderate to severe renal impairment. In clinical studies, administration of ezetimibe, 50 mg/day to 15 healthy subjects for up to 14 days, 40 mg/day to 18 patients with primary hyperlipidemia for up to 56 days, and 40 mg/day to 27 patients with homozygous sitosterolemia for 26 weeks was generally well tolerated. One female patient with homozygous sitosterolemia took an accidental overdose of ezetimibe 120 mg/day for 28 days with no reported clinical or laboratory adverse events. In the event of an overdose, symptomatic and supportive measures should be employed. 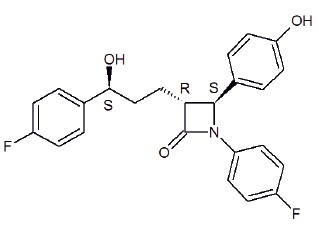 Ezetimibe, USP is a white to off white, crystalline powder that is soluble in methanol. Ezetimibe, USP has a melting point of about 163°C and is stable at ambient temperature. 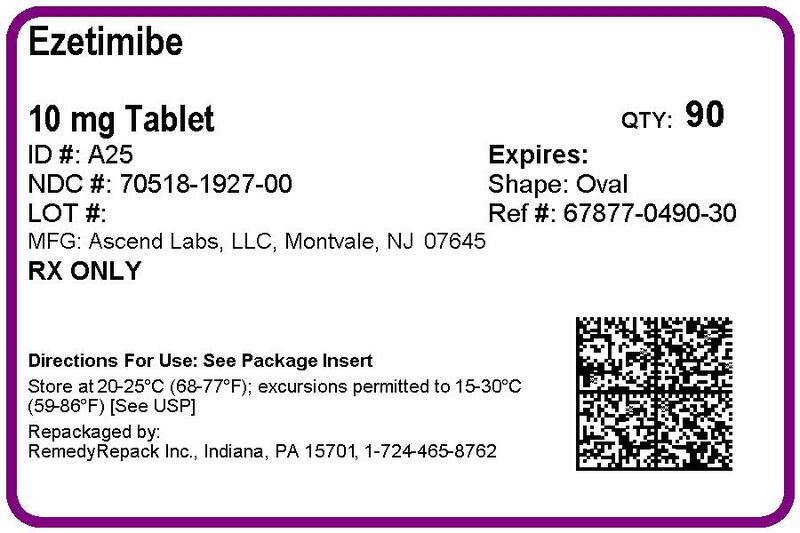 Ezetimibe Tablet, USP is available as a tablet for oral administration containing 10 mg of ezetimibe, USP and the following inactive ingredients: lactose monohydrate, croscarmellose sodium, Hypromellose, sodium lauryl sulfate, crospovidone, microcrystaline cellulose, and magnesium stearate. Clinical studies have demonstrated that elevated levels of total-C, LDL-C and Apo B, the major protein constituent of LDL, promote human atherosclerosis. In addition, decreased levels of HDL-C are associated with the development of atherosclerosis. Epidemiologic studies have established that cardiovascular morbidity and mortality vary directly with the level of total-C and LDL-C and inversely with the level of HDL-C. Like LDL, cholesterol-enriched triglyceride-rich lipoproteins, including very-low-density lipoproteins (VLDL), intermediate-density lipoproteins (IDL), and remnants, can also promote atherosclerosis. The independent effect of raising HDL-C or lowering TG on the risk of coronary and cardiovascular morbidity and mortality has not been determined. Ezetimibe Tablets reduces total-C, LDL-C, Apo B, non-HDL-C, and TG, and increases HDL-C in patients with hyperlipidemia. Administration of Ezetimibe Tablets with a statin is effective in improving serum total-C, LDL-C, Apo B, non-HDL-C, TG, and HDL-C beyond either treatment alone. Administration of Ezetimibe Tablets with fenofibrate is effective in improving serum total-C, LDL-C, Apo B, and non-HDL-C in patients with mixed hyperlipidemia as compared to either treatment alone. The effects of ezetimibe given either alone or in addition to a statin or fenofibrate on cardiovascular morbidity and mortality have not been established. AbsorptionAfter oral administration, ezetimibe is absorbed and extensively conjugated to a pharmacologically active phenolic glucuronide (ezetimibe-glucuronide). After a single 10-mg dose of Ezetimibe Tablets to fasted adults, mean ezetimibe peak plasma concentrations (Cmax) of 3.4 to 5.5 ng/mL were attained within 4 to 12 hours (Tmax).Ezetimibe-glucuronide mean Cmax values of 45 to 71 ng/mL were achieved between 1 and 2 hours (Tmax). There was no substantial deviation from dose proportionality between 5 and 20 mg. The absolute bioavailability of ezetimibecannot be determined, as the compound is virtually insoluble in aqueous media suitable for injection.Effect of Food on Oral AbsorptionConcomitant food administration (high-fat or non-fat meals) had no effect on the extent of absorption of ezetimibe when administered as Ezetimibe tablets 10-mg tablets. The Cmax value of ezetimibe was increased by 38% with consumption of high-fat meals. Ezetimibe Tablets can be administered with or without food.DistributionEzetimibe and ezetimibe-glucuronide are highly bound (>90%) to human plasma proteins.Metabolism and ExcretionEzetimibe is primarily metabolized in the small intestine and liver via glucuronide conjugation (a phase II reaction) with subsequent biliary and renal excretion. Minimal oxidative metabolism (a phase I reaction) has been observed in all species evaluated.In humans, ezetimibe is rapidly metabolized to ezetimibe-glucuronide. Ezetimibe and ezetimibe-glucuronide are the majordrug-derived compounds detected in plasma, constituting approximately 10 to 20%and 80 to 90% of the total drug in plasma, respectively. Both ezetimibe and ezetimibe-glucuronide are eliminated from plasma with a half-life of approximately 22 hours for both ezetimibe and ezetimibe-glucuronide. Plasma concentration-time profiles exhibit multiple peaks, suggesting enterohepatic recycling.Following oral administration of 14C-ezetimibe (20 mg) to human subjects, total ezetimibe (ezetimibe + ezetimibe-glucuronide) accounted for approximately 93% of the total radioactivity in plasma. After 48 hours, there were no detectable levels of radioactivity in the plasma.Approximately 78% and 11% of the administered radio activity were recovered in the feces and urine, respectively, over a 10-day collection period. Ezetimibe was the major component in feces and accounted for 69% of the administered dose, while ezetimibe-glucuronide was the major component in urine and accounted for 9% of the administered dose.Specific PopulationsGeriatric Patients: In a multiple-dose study with ezetimibe given 10 mg once daily for 10 days, plasma concentrations for total ezetimibe were about 2-fold higher in older (≥65 years) healthy subjects compared to younger subjects. Renal Impairment: After a single 10-mg dose of ezetimibe in patients with severe renal disease (n=8; mean CrCl ≤30mL/min/1.73 m2), the mean AUC values for total ezetimibe,ezetimibe-glucuronide, and ezetimibe were increased approximately 1.5-fold, compared to healthy subjects (n=9). Ezetimibe Tablets had no significant effect on a series of probe drugs (caffeine, dextromethorphan, tolbutamide, and IVmidazolam) known to be metabolized by cytochrome P450 (1A2, 2D6, 2C8/9 and 3A4)in a “cocktail” study of twelve healthy adult males. This indicates that ezetimibe is neither an inhibitor nor an inducer of these cytochrome P450 isozymes, and it is unlikely that ezetimibe will affect the metabolism of drugs that are metabolized by these enzymes. 0-24hr for total ezetimibe). There were no statistically significant increases in tumor incidences in drug-treated rats or mice. 50 values in dogs, rats, and mice were 7, 30, and 700 mcg/kg/day, respectively. These results are consistent with Ezetimibe Tablets being a potent cholesterol absorption inhibitor. 14C-cholesterol with no effect on the absorption of triglycerides, fatty acids, bile acids, progesterone, ethinyl estradiol, or the fat-soluble vitamins A and D.
* For triglycerides, median % change from baseline † Baseline - on no lipid-lowering drugThe changes in lipid endpoints after an additional 48 weeks of treatment with Ezetimibe Tablets co-administered with fenofibrate or with fenofibrate alone were consistent with the 12-week data displayed above. , ezetimibe was dosed at least 4 hours before or after administration of resins. Mean baseline LDL-C was 341 mg/dL in those patients randomized to atorvastatin 80 mg or simvastatin 80 mg alone and 316 mg/dL in the group randomized to Ezetimibe Tablets plus atorvastatin 40 or 80 mg or simvastatin 40 or 80 mg. Ezetimibe Tablets, administered with atorvastatin or simvastatin (40 and 80 mg statin groups, pooled), significantly reduced LDL-C (21%) compared with increasing the dose of simvastatin or atorvastatin monotherapy from 40 to 80 mg (7%). In those treated with Ezetimibe Tablets plus 80 mg atorvastatin or with Ezetimibe Tablets plus 80 mg simvastatin, LDL-C was reduced by 27%. , ezetimibe was dosed at least 2 hours before or 4 hours after resins were administered. Excluding the one subject receiving LDL apheresis, Ezetimibe Tablets significantly lowered plasma sitosterol and campesterol, by 21% and 24% from baseline, respectively. In contrast, patients who received placebo had increases in sitosterol and campesterol of 4% and 3% from baseline, respectively. For patients treated with Ezetimibe Tablets, mean plasma levels of plant sterols were reduced progressively over the course of the study. The effects of reducing plasma sitosterol and campesterol on reducing the risks of cardiovascular morbidity and mortality have not been established. NDC 67877-490-55 bottles of 5000. Store at 25°C (77°F); excursions permitted between 15 to 30°C (59 to 86°F). [See USP Controlled Room Temperature.] Protect from moisture. Tablets, USPRead this information carefully before you start taking Ezetimibe Tablets and each time you get more Ezetimibe Tablets. There may be new information. This information does not take the place of talking with your doctor about your medical condition or your treatment. If you have any questions about Ezetimibe Tablets, ask your doctor. Only your doctor can determine if Ezetimibe Tablets is right for you. What is Ezetimibe Tablets? Ezetimibe Tablet is a medicine used to lower levels of total cholesterol and LDL (bad) cholesterol in the blood. Ezetimibe Tablet is for patients who cannot control their cholesterol levels by diet and exercise alone. It can be used by itself or with other medicines to treat high cholesterol. You should stay on a cholesterol-lowering diet while taking this medicine. Ezetimibe Tablets works to reduce the amount of cholesterol your body absorbs. Ezetimibe Tablets does not help you lose weight. Ezetimibe Tablets has not been shown to prevent heart disease or heart attacks. For more information about cholesterol, see the “What should I know about high cholesterol?” section that follows. Who should not take Ezetimibe Tablets? • Do not take Ezetimibe Tablets if you are allergic to ezetimibe, the active ingredient in Ezetimibe Tablets, or to the inactive ingredients. For a list of inactive ingredients, see the “Inactive ingredients” section that follows. • If you have active liver disease, do not take Ezetimibe Tablets while taking cholesterol-lowering medicines called statins. • If you are pregnant or breast-feeding, do not take Ezetimibe Tablets while taking a statin. • If you are a woman of childbearing age, you should use an effective method of birth control to prevent pregnancy while using Ezetimibe Tablets added to statin therapy. Ezetimibe Tablets has not been studied in children under age 10. What should I tell my doctor before and while taking Ezetimibe Tablets? Tell your doctor about any prescription and non-prescription medicines you are taking or plan to take, including natural or herbal remedies. Tell your doctor about all your medical conditions including allergies. Tell your doctor if you: • ever had liver problems. Ezetimibe Tablets may not be right for you. • are pregnant or plan to become pregnant. Your doctor will discuss with you whether Ezetimibe Tablet is right for you. • are breast-feeding. We do not know if Ezetimibe Tablets can pass to your baby through your milk. Your doctor will discuss with you whether Ezetimibe Tablet is right for you. • experience unexplained muscle pain, tenderness, or weakness. How should I take Ezetimibe Tablets? • Take Ezetimibe Tablets once a day, with or without food. It may be easier to remember to take your dose if you do it at the same time every day, such as with breakfast, dinner, or at bedtime. If you also take another medicine to reduce your cholesterol, ask your doctor if you can take them at the same time. • If you forget to take Ezetimibe Tablets, take it as soon as you remember. However, do not take more than one dose of Ezetimibe Tablets a day. • Continue to follow a cholesterol-lowering diet while taking Ezetimibe Tablets. Ask your doctor if you need diet information. • Keep taking Ezetimibe Tablets unless your doctor tells you to stop. It is important that you keep taking Ezetimibe Tablets even if you do not feel sick. See your doctor regularly to check your cholesterol level and to check for side effects. Your doctor may do blood tests to check your liver before you start taking Ezetimibe Tablets with a statin and during treatment. What are the possible side effects of Ezetimibe Tablets? In clinical studies patients reported few side effects while taking Ezetimibe Tablets. These included diarrhea, joint pains, and feeling tired. Patients have experienced severe muscle problems while taking Ezetimibe Tablets, usually when Ezetimibe Tablets was added to a statin drug. If you experience unexplained muscle pain, tenderness, or weakness while taking Ezetimibe Tablets, contact your doctor immediately. You need to do this promptly, because on rare occasions, these muscle problems can be serious, with muscle breakdown resulting in kidney damage. Additionally, the following side effects have been reported in general use: allergic reactions (which may require treatment right away) including swelling of the face, lips, tongue, and/or throat that may cause difficulty in breathing or swallowing, rash, and hives; raised red rash, sometimes with target-shaped lesions; joint pain; muscle aches; alterations in some laboratory blood tests; liver problems; stomach pain; inflammation of the pancreas; nausea; dizziness; tingling sensation; depression; headache; gallstones; inflammation of the gallbladder. Tell your doctor if you are having these or any other medical problems while on Ezetimibe Tablets. For a complete list of side effects, ask your doctor or pharmacist. What should I know about high cholesterol?